Unexpected encounters with animals and plants, mysterious phenomena and unique traditions of local residents await travelers and Arctic researchers on the glacial island of Greenland. The National Park in northeastern Greenland is the only one on the island and also the largest and most northern park in the world. 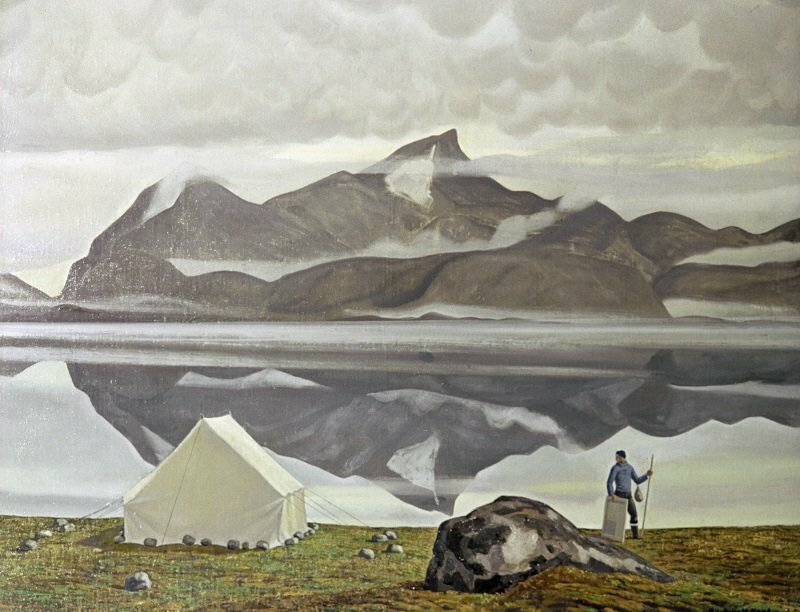 It was established on May 22, 1974 in the practically uninhabited region of Ittoqqortoormiit and three years later acquired the status of an international biosphere natural reserve and was included in the list of the UNESCO World Network of Biosphere Reserves. The park begins near the northeastern coast line and covers 972,000 square kilometers in total. There are mountains, snow-covered deserts and snow-white hills in various parts of the park. In total, there are about 300 endemic plants in the reserve. However, the flora here appears scanty due to the ice-covered and barren soil. In the summer the mountain landscape is richly decorated with colorful bushes, mosses, grasses, and flowers. There even are small trees such as crowberry, the arctic willow, and the dwarf birch. There also are such rare plants as the purple saxifrages and mountain avens, also called the white dryad. A very attentive traveler can see the most amazing species, such as five kinds of orchids that grow there despite the harsh climate: yellow coralroot, Goodyera repens, northern green orchid, swamp orchid and lesser twayblade. Greenland is located between America and Europe, so there are species from both continents. Surprisingly, some plants here grow better than in their home countries, such as fireweed or dwarf fireweed, which is the national flower of Greenland. The reserve's fauna is even less diverse: there are only nine species of land mammal. Just several years ago a caribou's call could be heard there, but today it is nearly impossible, though there are about 11 herds still living in the south and west of the island. In 1934, the Alaskan tundra wolves left the park, although they sometimes come back to Greenland migrating from Ellesmere Island, Canada. However, muskoxen are the reserve's main inhabitants, with their local population accounting for 40 percent of the total number of muskoxen in the world. Polar bears often visit the park. They are the largest land predators attracted here by their favorite food: ringed seals. Greenland whales and seals come near the shore in the summer, and walruses and narwhals back in the tender Arctic sun while blue foxes and stoats hunt lemmings and polar bears. Bird colonies with common loons and various goose species can also be noisy. Rock ptarmigans, crows, Pallas's reed buntings, owls and hawks that live in the park all year round try to stay away from the noise. Willow ptarmigan is another rare bird included in the IUCN Red Data List that lives here. If Greenland's National Park were an independent state, it would rank 31st after Egypt in terms of area, exceeding more than 160 various countries in size, but all these thousands of square kilometers are home to only 27 people – scientists and personnel at the local military base and weather stations – and 110 dogs. Indigenous people account for 80-88% of Greenland's population. On the boundaries of the national park you can meet representatives of two Eskimo peoples – the Thule, the northernmost aboriginal group in the world, and the Ammassalik (Tunumiit). The nearest settlement to the park is the small town of Ittoqqortoormiit, founded by Ejnar Mikkelsen, who arrived here on the ship Gustav Holm in 1925. Only the inhabitants of this town are allowed to hunt in the national park. Their main income derives from the sale of bear and whales meat, although it is seasonal and variable. Some money is brought in by fishing, aided by shoals of cod, halibut, capelin, salmon and shrimp that move past Ittoqqortoormiit, but the pack ice makes fishing impossible for several months of the year. ©RIA Novosti. A. Sverdlov. 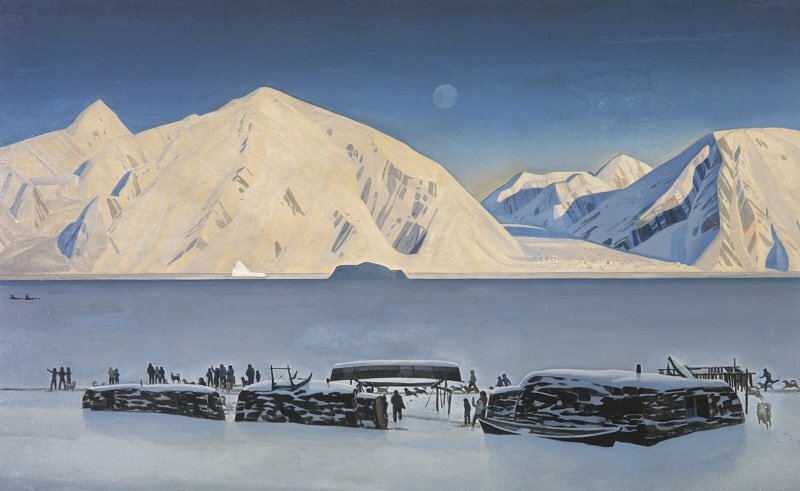 A reproduction of Rockwell Kent's painting "Fjord in Northern Greenland"
For many years the park was closed to tourists and only received research expeditions. But recently the Danish Polar Center started issuing special permits to all those who want to see this unique place on the world's largest island. In May, polar days start there and last until the middle of July, ice fiords melt and the navigation period lasts until October. The first thing to see is the deepest and longest fiord in the world, the Scoresby Sund, a gulf with a rocky coast that just cut inland. It has a tree-shape structure with many branches, the longest of which is 350 kilometers long. The fiord was first mapped in 1822 by William Scoresby, the whaler, and his son, for whom it was named. Another great experience is walking to Danmarkshavn, a naval weather station located at the northernmost point where non-icebreaking vessels can still pass. Eight people in two shifts record weather conditions there every day. On the ground at a height of two meters they take readings of atmospheric pressure, air temperature and humidity, and wind direction and speed. The staff's main responsibility is launching a probe daily to a height of up to 35 kilometers. Meters attached to the probe provide atmospheric data. Information about the air flow is especially important because it helps weather forecasting not only in Europe but the whole of the northern hemisphere. For this reason, the weather on the island is very important for meteorologists whose data go, via space satellite, to all international weather agencies. The main reason for the scantiness of plant and animal life in the world's largest biosphere reserve is the Arctic climate characterized by harsh winters with snow covering the ground over eight months. 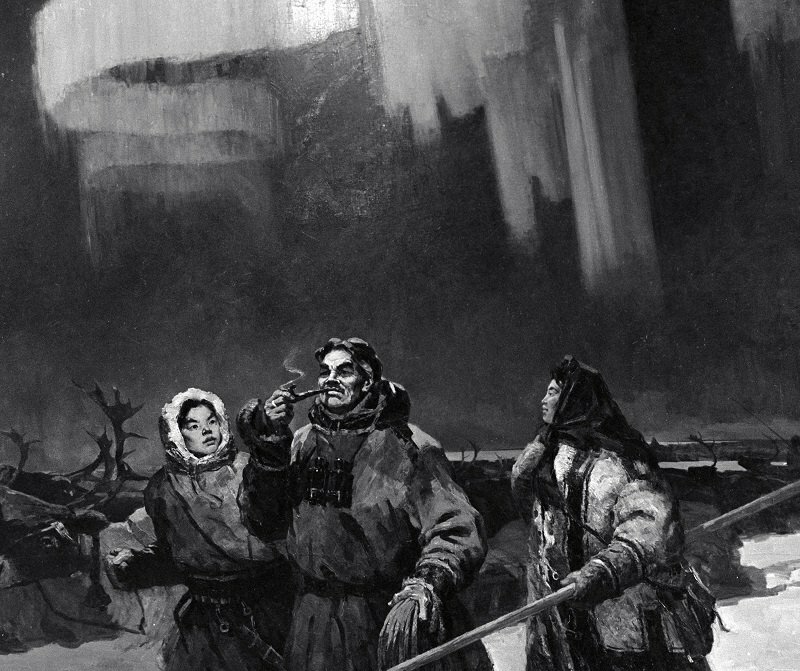 In summer the temperature in the south of the island only reaches 6 C and in the north 3 C, while in winter it ranges from -30 C to -50 C.
According to ancient legend, when the polar lights dance in the night sky, dead people's souls play football with a walrus skull. There is also a belief that whistling causes the play of lights to intensify, and if it lasts for a long time souls may carry off the whistler. Vikings believed that the polar lights were mythical woman warrior Valkyrie's armor twinkling in the night. According to another old Scandinavian legend, the magic glow is made by a sky fox which sparks the flashing sky lights with its tail. The density of the different shades of colors flowing in the sky in rivulets – emerald and bright-green, turquoise, purple and scarlet – are amazing. Some of those who witnessed this phenomenon even said that they could hear the lights singing, though the lights "hang" at a height of 100-160 kilometers and if there were sound it would take several minutes to reach the observer.